We’re now in Week 17 of the NFL season. To help prepare, here’s my weekly look at the top starts and sits for fantasy football players in IDP leagues. Navigating the IDP waters in the final week of the season can be a bit tricky as teams locked into playoff positions may rest players and teams out of contention may take that same route. That said, there are still some very good options for Week 17 as teams battling for the playoffs will be giving it all they have and playing the starters all the way. Let’s do this. If it ain’t broke, then don’t fix it. We liked the red-hot Buckner last week as a start option and he came through with three solo tackles, a sack, and a fumble recovery. 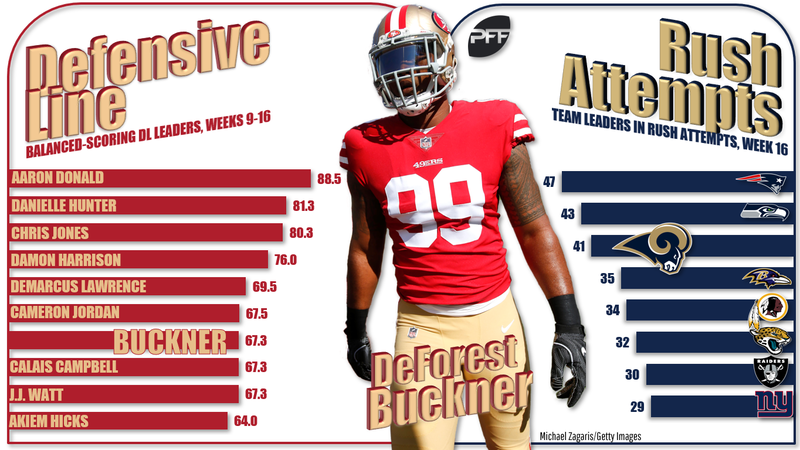 Since Week 9, Buckner has been producing top-five fantasy totals at defensive line with 35 total tackles and 7.5 sacks. Even if the Rams decide to sit Todd Gurley for this game, there will be ample tackle opportunities for Buckner. Los Angeles rushed the ball 41 times last week in their victory over the Cardinals. Let’s ride the hot hand again in Week 17. The Texans need a win at home in Week 17 to lock up the AFC South with the Colts and Titans breathing down their necks. This is a positive matchup for Clowney to continue the roll he has been on of late. In the last two games, Clowney has racked up 11 total (seven solo) tackles with two sacks along with a forced and recovered fumble. Jacksonville’s offense continues to struggle (Blake Bortles back under center isn’t likely to help) and in the Week 7 matchup between the teams Clowney put up seven solo tackles along with two sacks and a fumble recovery. The Cowboys are locked in as the four seed in the NFC playoffs, but owner Jerry Jones has stated that they will play to win. Gregory is coming off one of his better fantasy performances in Week 16. But even with all that, there’s no guarantee the Cowboys play their starters throughout. In the team’s victory over Tampa Bay, Gregory had two solo tackles with a strip sack (that led to a Jaylon Smith return for a touchdown) and a fumble recovery. It’s the matchup and snap count that land Gregory a sit designation. Over the last four weeks, Gregory is still playing just 57% of the defensive snaps. In their last three games the Giants have allowed only 26 total tackles and one sack to the defensive line position. The Colts are in a win-and-in game Sunday night at Tennessee and will definitely be playing all their starters. Unfortunately, things have been trending in the wrong direction for the veteran defensive end. In the last five games Sheard has failed to register a sack and has managed just 15 total tackles with one fumble recovery. That does not bode well against a Titans offense that is allowing an average of only 14 tackles per game to defensive linemen over the past three weeks. Tennessee has also been stingy in allowing splash plays over that time, having given up just a single sack. It’s a twofer! This matchup is too juicy to pass up as the Browns look to play spoiler in Week 17. If Cleveland wins at Baltimore and the Steelers beat the Bengals, then Pittsburgh leapfrogs Baltimore to win the AFC North. The duo had a down Week 16, combining for just five total tackles, but Schobert did manage to save his week with a sack and forced fumble. There will be tackle opportunities galore this week against a Ravens offense averaging 43 rush attempts over their last four games. In that time five linebackers have posted at least eight total tackles against the Ravens and the position has six sacks. The second-year linebacker is flourishing as a three-down player and has been putting up great fantasy production of late. In his last three games Reddick has an impressive 19 solo (24 total) tackles along with two sacks. Those are LB1 totals from a fantasy perspective in balanced-scoring formats. The Seahawks offense is among the most generous when it comes to allowing fantasy production to opposing linebackers. In the past three games, Seattle is allowing an average of 28 total tackles per game to linebackers and have given up five splash plays to the position. The Bears can score a first-round bye with a win at Minnesota and a Rams loss to the 49ers in Week 17. That should translate to a full set of snaps for the rookie linebacker … but the matchup is a rough one for Smith. In their last three games the Vikings allow an average of 16 total tackles per game to linebackers and have not allowed a splash play to the position. Also keep in mind that if the Rams should get up big over San Francisco (a likely scenario), the Bears may decide to pull their starters in order to be ready for Wild Card weekend. There are better options as the 2018 regular season comes to an end. This is the short-and-sweet sit of the week. In the Week 16 loss to the Rams, Hodges played 11 snaps. It appears Arizona has turned back to Deone Bucannon, who played 64 snaps in Week 16. It’s time to send Hodges back to the bench, just as the Cardinals have done. Let’s give some love to the cornerback position as safeties generally dominate the start designations. In his second season, Douglas has blossomed into a fantasy force and has been putting up huge numbers over the last four games. 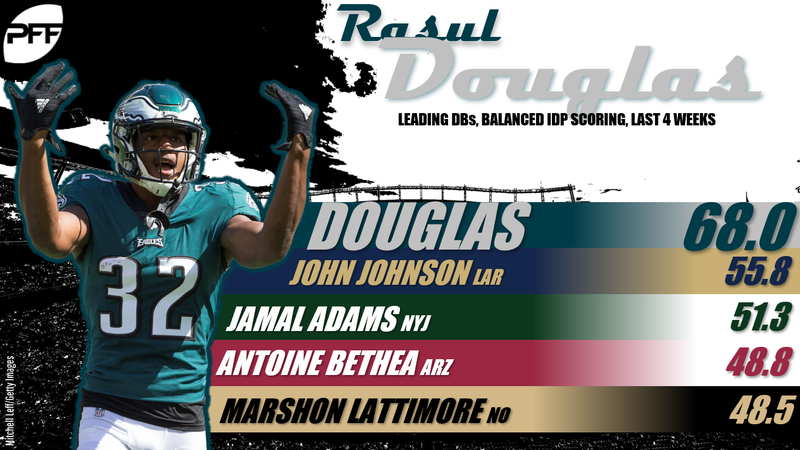 Douglas is the top-scoring defensive back in that time with 34 solo (39 total) tackles and an interception. The main reason for that production is that opposing offenses are targeting Douglas in coverage frequently. In the four-game stretch Douglas has been targeted 41 times and is allowing 70% of the passes to be completed. That translates into plenty of tackle opportunities and the matchup this week is a positive one. The Redskins are a top-five offense in allowing points to defensive backs. The Titans are in a must-win situation and are dealing with quarterback issues as Marcus Mariota deals with a stinger and nerve issues. That means the Titan defense will need to step up and make some splash plays. The most dynamic player on the defense is Byard, who has been producing splash plays and impressive tackle totals in the past two weeks. In that time, Byard has 14 total tackles along with a sack and an interception in back-to-back games. The tackle totals can be attributed to the fact that Byard has lined up in the box or on the defensive line 41 times in the past two games. It’s tough to sit one of the hottest defensive backs in all of fantasy, one who likely helped IDP owners reach the championship game. In the last four weeks, Lattimore has put up 26 total tackles and been a splash-play machine with an interception and two forced fumbles, one recovered. That’s the good news. The bad news is that it’s highly unlikely that Lattimore plays the entire game with the Saints having wrapped up home field throughout the playoffs. It’s too risky to roll with a player who may not make it to halftime before being pulled from the game. The Steelers need a Week 17 victory over the Bengals and some help from the Browns to keep their fading playoff hopes alive. Davis is coming off a big Week 16 in which he posted five solo tackles and an interception. Unfortunately, he is also dealing with a quadriceps injury and we’ll need to keep an eye on practice reports out of Pittsburgh this week. The Bengals are also a tough matchup as they have allowed just two splash plays to defensive backs in the last three weeks. In the Week 6 matchup Davis finished with a single solo tackle against Cincinnati.